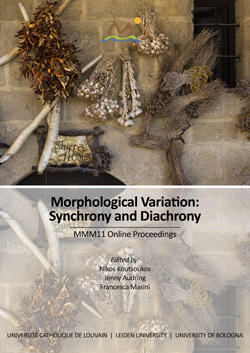 The Proceedings of the Mediterranean Morphology Meetings (MMM). Since 1997, the Mediterranean Morphology Meetings (MMM) have been jointly organized by Prof. Geert Booij (Leiden University), Prof. Angela Ralli (University of Patras), and Prof. Sergio Scalise (University of Bologna). Since 2013, the Permanent Scientific Committee has been expanded with three new members: Jenny Audring (University of Leiden), Nikos Koutsoukos (University of Patras & Université catholique de Louvain) and Francesca Masini (University of Bologna). In each meeting, the Permanent Scientific Committee cooperates with a Local Organizing Committee. The aim of MMM is to provide an informal setting for linguists working on morphology to present and discuss their work. The set-up of the conference guarantees a maximal interaction between researchers, and gives young linguists the chance to present their work at a conference of moderate size, where fruitful contacts with senior linguists can be established. The first nine meetings –1997 (Mytilene, Greece), 1999 (Lija, Malta), 2001 (Barcelona, Spain), 2003 (Catania, Sicily), 2005 (Fréjus, France), 2007 (Ithaca, Greece), 2009 (Nicosia, Cyprus), 2011 (Cagliari, Sardinia) and 2013 (Dubrovnik, Croatia) - have proven the success of this formula. Many good abstracts were submitted, the attendance was high, and a number of leading morphologists participated.